Oxidation (13 Papers). Hydrogenation (3 Papers). Zeolite Catalysis (8 Papers). Surface Science and Modeling (8 Papers). Author Index. Structure plays an important role in heterogeneous catalysis. It provides a framework for the arrangement and stragetic placement of key catalytic elements, hosting them in a prescribed manner so that their respective electronic properties can exhibit their desired catalytic functions and mutual interactions. Under reaction conditions these framework structures and their catalytic guests undergo dynamic processes becoming active participants of the overall catalytic process. They are not mere static geometric forms. The dynamics of catalytic structures are particularly vivid in selective oxidation catalysis where the lattice of a given catalytic solid partakes as a whole, not only its surface, in the redox processes of the reaction. The catalyst becomes actually a participating reagent. By proper choice of key catalytic elements and their host structures, preferred catalytic pathways can be selected over less desired ones. However, not only in selective redox catalysis does structure play an important role, its importance is also well documented, among others, in shape selective zeolite catalysis, enantioselective hydrogenation and hydrodesulfurization. 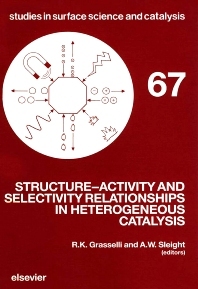 The contributions presented in this book address the dynamic character of the solid state under catalytic reaction conditions. By relating structure to activity and selectivity in heterogeneous catalysis our understanding of such correlations has been significantly enhanced through the use of sophisticated spectroscopic means, surface science and modeling.